Like everyone who suffered through high school English classes, I have always maintained a healthy disrespect for “the classics.” What I learned from English class is that, for the most part, literature is a form of punishment, where drab and joyless works are held up as exemplars to be studied, dissected, and ultimately emulated. In college, our freshman English classes were run by disaffected Marxist TA’s. They showed me that when examining a text – among grad students, even a cheeseburger is a “text” – worrying about the quality of the writing, as opposed to its political significance, was the sign of a stunted bourgeois mentality. So it came to a shock to me when I read Treasure Island as an adult, and found that it was a thrilling, vibrant read: not simply a great story, but a well-written book. Where was this book all my life? Why subject students to The Scarlet Letter and stamp a boot into the face of their urge to read, forever, when you could give them a book they couldn’t put down? This month I began reading The Count of Monte Cristo and am having that same feeling all over again. It is a book that is so superbly crafted, so honed, so polished, that – to borrow a phrase from Douglas Adams – every few pages I have to suppress the urge to break into spontaneous applause. I came to the book, amusingly, because I had seen an animated version, called Gankutsuo, that I thought was quite good. My friend Dan, one of those infuriating people who speaks 6 languages fluently and can explain to you exactly why The Master and Margarita is not worth reading except in the original Russian, refused to watch it. This was odd, because Dan is addicted to all things anime. His explanation was simple: “It’s the best book ever written. So they can’t possibly do it justice.” At the time, I enjoyed the animated version very much. We are children of Hollywood. Any story can be pitched in 10 seconds or less. If the story has heart, and we can get Julia Roberts and Bruce Willis to star in it, it doesn’t matter how shabby the writing is. Anger over this was, I believe, one of the factors underlying A.S. Byatt’s blistering excoriation of the Harry Potter books in the New York Times. I enjoy Rowling’s books very much. I think she’s a wonderful storyteller. But being a wonderful storyteller is a different thing than being a wonderful writer. Rowling, however powerful her stories, does not write beautiful sentences. To give a more extreme example, Frank Herbert’s Dune is a book with a compelling story but that is so badly written that you should read the Cliff’s Notes version instead. The inverse of this problem, to find a piece of writing with beautiful sentences but a stupid, dull, or boring concept, seems to me to be more rare. Perhaps this is because good writing, to some extent, is its own excuse. But it does happen, as in Dave Eggers’ A Heartbreaking Work of Staggering Genius, which is an endless succession of beautiful sentences wrapped around a moral and intellectual vacuum. Dumas writes beautiful sentences. That they maintain their beauty in English is to the credit not simply of the translator, but to the directness of his prose. He was a 19th century Frenchman who, with his ghost writers and collaborators, wrote clearly and simply, yet with great subtlety. Compared to his contemporaries (consider Dickens), Dumas’ writing was as sharp-edged as Raymond Chandler’s. Monte Cristo works today because it is the convergence of both great writing and a timeless story of love, loss, and revenge. Subsequent expressions of boyish id-birthed fantasies, such as The Scarlet Pimpernel, James Bond, and Batman, all have their roots in Monte Cristo’s Edmond DantÃˆs. One hundred and fifty years after this book was written it still reverberates in Western culture. “I am brutal, – I not only allow it, but boast of it; it is one of the reasons of my success in commercial business. Why did he kill himself instead of you? Because he had no cash to save. My life belongs to my cash. M. Debray has made me lose 700,000 francs; let him bear his share of the loss, and we will go on as before; if not, let him become bankrupt for the 250,000 livres, and do as all bankrupts do – disappear. He is a charming fellow, I allow, when his news is correct; but when it is not, there are fifty others in the world who would do better than he. As I said, I began reading it about a month ago. I checked it out from the library, and about halfway through realized that I wanted to own a copy, because I will surely re-read it. Upon searching for one to buy, I noticed something odd. The book I was reading was just under 1500 pages. Nearly every edition I could find was about 500 pages. The version that most English- speaking people read is terribly abridged. I have nothing against abridgements in general. There are many books that should only be read after they have been judiciously edited. For example, I’d pay good cash money for a copy of The Lord of the Rings that simply had all the poetry excised. And I wouldn’t cry crocodile tears if, say, you erased every third word from Umberto Eco’s Island of the Day Before. But I cannot for the life of me imagine how you remove a thousand pages from this book and preserve its soul. Perhaps one could tighten up the first few chapters a bit, but beyond that, I don’t think I could remove fifty pages without feeling like I had done violence to it. Every page, once the story proper gets underway, is superb. I don’t have any deep point to make here. Perhaps writing this paean to Dumas’ finest work is my way of channelling all that energy created by repressing my urge to cheer while reading it. If you’ve never read The Count of Monte Cristo, do yourself a favor and pick it up. A.S. Byatt’s article Harry Potter and the Childish Adult enraged many readers. In places she is terribly, terribly wrong, but to dismiss her points entirely would be a mistake. Amazon also carries the Japanese anime version. It’s an interesting work in its own right. 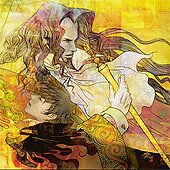 It is visually bold and unique, has wonderful music, and makes some interesting narrative choices (for example, converting Albert’s relationship with the Count from vigorous admiration into an overt homosexual crush was a bold move.) But it’s telling a fundamentally different story. Enjoy it if you will, but don’t fool yourself that you “know” the book just from seeing the animated version. I’m told that The Master and Margarita is effectively untranslatable into English. I enjoyed it nonetheless.